The Middle Eastern country of Oman is ranked as one of the safest countries in the world, and it has some incredible sights that range from historic castles, to desert canyons and rocky mountains. I visited this country in 2018 and really enjoyed it. One of my biggest regrets was not booking a longer trip here. Here are 9 of the best things to do & see near Muscat, Oman! Did you know there’s a grand canyon in Oman? Neither did I, but the views at Jebel Shams are surprisingly similar to its twin in Arizona, so the name makes sense. The views looking down into this canyon are mindblowing. The souq (market) at Nizwa has a lot of interesting souvenirs, from traditional clay pots to Oman fridge magnets and more. I was only here for 20-30 minutes, but easily could have stayed longer! The Nizwa Fort is right next to the souq, and you can tour the entire building, complete with the same store rooms, old weapons, and artifacts from the 17th century. This is a good walk through history. If you plan to visit Rustaq, one place worth seeing on the way there is the Nakhl-Barka market. This is a traditional fish market, and there are all kinds of fish for sale here. It’s an interesting place to stop, for sure. An Naman castle may not be as well known as some of the other forts in Oman, but I think it’s one of the most photogenic, and it just reopened after years of restoration work. It’s free to go inside! 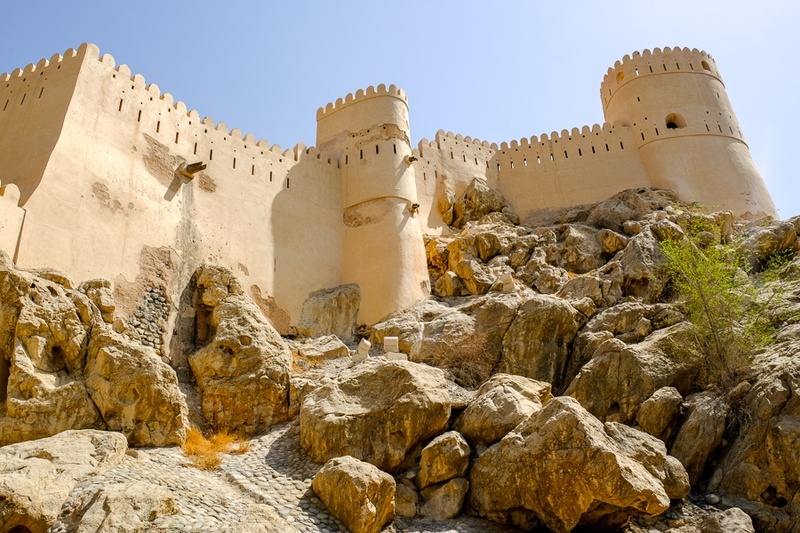 This is one of the less known castles in Oman, but I still think it’s definitely worth a visit. Al Hazm Castle is located near Rustaq, so it’s easy to visit if you’re planning to go see Rustaq Fort or Nakhal Fort (below). No trip to Oman would be complete without a visit to Rustaq Fort. This is one of the most well known forts in the country, and it’s also one of the most impressive looking. It’s well worth a climb to the top of this fort! Nakhal Fort was probably my favorite castle/fort in Oman. Not only is it super photogenic from a distance, but going up to the rooftop also gives you some incredible views of the surrounding area. This is a natural hot spring very close to Nakhal Fort. The springs are nice, but I think an even better reason to come here is for the surroundings. Check out those mountains!